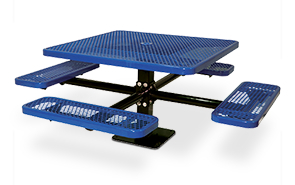 Create that great comfortable gathering place while maximizing enjoyment, accessibility and safety with this single pedestal square steel picnic table. The expanded steel table top and seats utilizes the strength advantage of steel—and conveniently, allows rain water to filter through and dry quickly for way-more fun time. The main pedestal column is constructed with 4" x 4" powder-coated commercial grade square steel tube that supports the table top, extension arms and the seat bench plus lots of enjoyment. Steel frames are powder-coated to help them maintain their pristine characteristics. The table tops and seats are finished in an impact, weather and vandal resistant polyethylene coating. This square diamond pattern steel table is a great addition to provide seating in public areas. Surface and in-ground mounting options available with two, three and four attached seats and all stainless steel hardware.